May saw a substantial increase (23%) in dollar sales from April. Sales were slightly lower in units and slightly higher in dollars than last year, which was very robust. The next few months should show us a more consistent pattern. Prices are modestly increasing. Total dollar sales for May were $421,269,944 up 3% from $409,254,772 last year, and up 23% from last month at $342,710,819. Total Unit sales were down 4% at 1,857 in May from 1,943 last year and off by 17% compared with 1,585 in April. New sales were down 17 at 163 homes this month, vs. 180 in April, and off by 13 from 176 last year. The low inventory level of new homes suggests a good environment for builders. Used sales were 1,694 homes in May, up 21% from 1,404 last month, and off by 4% from 1,767 last year (Sect E p.3). ACRE numbers are slightly different from those we report. For ACRE, our month by month 2017 forecast can be seen here: ACRE. For Birmingham, the full year projection for 2017 = 15,238, a 3.6% difference from 2016 actual of 14,705. The cumulative error is minus 2% for the year; that is actuals are behind projections of 4,451 through April, at 4,440 actual thru April. Check the link to see when the May numbers are posted. Total inventory is slightly higher this month at 8,635 vs. last month at 8,126 and less than 9,407 last year. (Sect C p.1). Active New listings decreased to 999 in May from 1,033 in April (Sect E p.3). Absorption rate for New homes is at 6 months supply this month, which is less than 7 months last year. (Sect E p.3). The New homes have normal inventory levels in the 4-8 month range depending on area and price range. (Sect C p.1). Absorption for Used homes in May shows 5 months, which is less than the 6 last year. Used Active listings at 7,636 are up from last month of 7,093, and less than 8,252 last year (Sect E p.3). Inventory levels have continued to trend down from prior years. Market performance is highly area specific, so check the individual area charts. For instance, Mountain Brook has between 1 and 6 months of inventory, 4 months overall. There are a number of MLS areas, particularly those known as the “over the mountain” communities, showing similarly low levels, including Homewood, which has 3 months of inventory. Birmingham area Average Days on Market for New houses is 205 compared with last month at 198. The Used homes DOM was 107 in May vs 104 last month, (Sect A p.18). 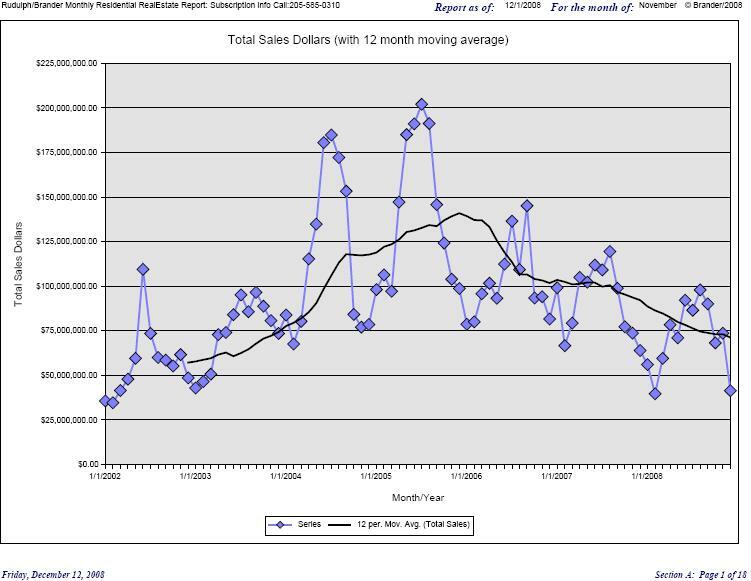 Average sales price for Sold New homes increased to $305,046 from $285,446 last month (Sect A p2). Over a several month period prices seem to be quite unchanged. Average sales price for Sold Used was $219,331 this month compared to $207,297 last month. (Sect A p2). Given the general robustness of sales prices on average seem quite stable, not yet increasing by much. After a brief pause last month sales seem to be back on the upswing, It will be interesting to see how sales unfold over the next few months.. This entry was posted in Absorption, Alabama Center for Real Estate, Birmingham, Forecast, Home values, Inventory, Jefferson County, Monthly comments, Shelby County and tagged Birmingham Area, Monthly comments, Monthly statistics, Real Estate sales on June 17, 2017 by Tom Brander. November saw a continuation of the pick up in dollar and unit sales over last year. Prices seem to be modestly increasing. Total dollar sales for November were $269,219,038 up 30% from $205,886,919 last year, and down 6% from last month at $287,629,774. Total Unit sales were off 10% at 1,283 in November from 1,428 in October, a decrease of 145. This is up by 22% and 231 from last November at 1,052. New sales were up to 164 homes this month, and 257 in October, and up by 43 from 121 last year. The low inventory level of new homes suggests a good environment for builders, and prices have begun to show a more solid uptrend. Used sales were 1,119 homes in November, off 12% from 1,271 last month, a decrease of 152, and up by 188 units from 931 last year (Sect E p.3). ACRE numbers are slightly different from those we report. With ACRE, we released our month by month 2016 forecast which can be seen here: ACRE. For Birmingham, the full year projection for 2016 = 13,460, a 1.25% difference from 2015 actual of 13,294. October overperformed the projection. The cumulative error is plus 9% year to date; that is actuals are running ahead of projections (through October). Housing permits for October are a bit less than last year. For Jefferson County, in October there were 66 permits compared with 101 last year. Shelby County was somewhat higher than last year’s level (see the web site). Total inventory is slightly lower this month at 8,654 vs. last month at 8,851 and less than 9,740 last year. It is curious that we don’t seem to be seeing the more normal seasonal reduction of inventory which has been remarkably stable since the beginning of the year without the normal uptick we usually see in the summer either (Sect C p.1). I’d guess that it is an indication of market equilibrium, as the months of inventory have stabilized at about the 6 month level. Active New listings decreased to 1,101 in November from 1,158 in October (Sect E p.3). Absorption rate for New homes is at 7 months supply this month, which is even with 7 months last year. (Sect E p.3). The New homes have normal inventory levels in the 4-8 month range depending on area and price range. (Sect C p.1). The level of inventory, both in months of inventory and housing units, has been continuing to improve for the year. Absorption for Used homes in November shows 6 months, which is less than the 7 last year. Used Active listings at 7,553 are down from last month of 7,693, and quite a bit less than 8,725 last year (Sect E p.3). Inventory levels have continued to trend down from prior years. Market performance is highly area specific, so check the individual area charts. For instance, Mountain Brook has between 1 and 4 months of inventory except in the over $900,000 category, which has 9 months of inventory (44 homes), with 4 sold in that price range last month. There are a number of MLS areas, particularly those known as the “over the mountain” communities, showing similarly low levels of inventory, including Homewood which has 3 months of inventory. Birmingham area Average Days on Market for New houses is 209 compared with last month at 201. The Used homes DOM was 122 in November vs 112 last month, (Sect A p.18). Average sales price for Sold New homes decreased to $299,783 from $313,521 last month (Sect A p2), over a several month period though prices seem to be increasing. Average sales price for Sold Used was $196,653 this month compared to $187,574 last month. (Sect A p2). This entry was posted in Alabama, Birmingham, Building Permit, Home values, Inventory, Jefferson County, Monthly comments, real estate, sales forecast, Shelby County and tagged Birmingham Alabama, Monthly comments, Real Estate sales, Sales Forecast on December 21, 2016 by Tom Brander. November dollar sales decreased 44% to $41,428,265 from $73,632,919 in October. (see page A-2). The poor showing was exaggerated by the absence of the large amount of closings last month for the largely pre sold condo development, Phoenix West. There were a few more sales recorded for this complex this month and but for those the overall sales results for the area would have been even worse. Our current records go back to 2002 and this was the worst November on record. There was notable sales activity in the Daphne/Montrose area for new homes in the $100,000-$300,000 price range. On a unit basis, sales of all houses declined by 35% to 174 vs. 268 last month. Used houses declined by 26% to 139 vs. 187 last month. New house unit sales declined 57% to 35 from 81 last month. (Sect A P. 18). The continued deterioration in the overall economic climate means that, we are looking at further deterioration in the local Real Estate markets. New listings for new houses decreased in November to 56 from 82 in October. A somewhat positive sign is that the new listing rate seems to be declining. New listings are running much closer to the rate of sales of new houses, a better rate than in past months. (Chart Section C Page 1 And Table Sect A P18). Used houses new listings decreased to 635 this month from 747 in October. Net active listings were down and are trending down for both new and used houses. (See below). Average sales price for new units decreased to $323,874 from $413,658 last month with the big drop due to absence of the sales of the Phoenix properties. Seven of the used over $500,000 houses sold while this is about half the number last month, some high end bargain seekers are in the market. (See Page A-14). The average used house price decreased to $216,494 from $274,164 in October. Interestingly, and encouraging, the absolute number of used houses active on the market has generally declined since peaking at 6,284 in June 2007, now at 5,230. The new house market peaked out in November 2006 at 2,145 active and now sits at 737. There were 5,230 used houses active in November, a slight decrease from a 5,422 in October. There were 737 new houses active in November, a decrease from 792 in October. The Absorption rate for new houses was 14.1 months of inventory for November vs. 14.6 in October. The Absorption rate for used houses was 22.8 months of inventory for November vs. 23.5 in October. (See Section A Page 17). This entry was posted in Absorption, Alabama, Alabama Coast, Baldwin, MLS, Monthly comments and tagged Baldwin County, November 2008, Real Estate sales on December 14, 2008 by Tom Brander.